Performance center allows the administrator to visualize and manage business performance. In this section it is possible to monitor all costs related to a certain task, team or a project in order to control financial profitability and increase business growth. 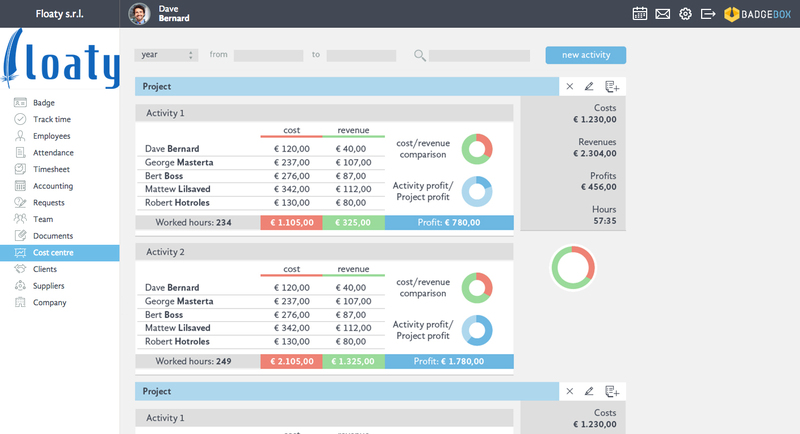 In order to visualize revenues and costs, it is necessary to define the time period of interest, after which the system calculates all costs and revenue related to selected task or a client. Adding fixed costs to the chart of interest allows us to obtain a more realistic performance perception. However, in order to obtain a realistic outcome it is necessary to define a correct cost and revenue for each resource and task. This means that each employee should define how many hours worked on a certain task. In this case, from section performance it is possible to control and manage total number of worked hours, cost and revenue for each employee, and total cost, revenue and profit or loss. This allows a simple and clear performance visualization.